The Lettera from Rottner is a single-walled furniture safe with deposit slot in the front. The slot is large enough to take envelopes or small cash deposits. Made of high-quality steel, the body of the safe is 2mm in thickness with a door leaf of 4mm. The robust hinges are concealed, while the safe can be anchored through pre-drilled holes to either the floor or wall. Fixings are included. 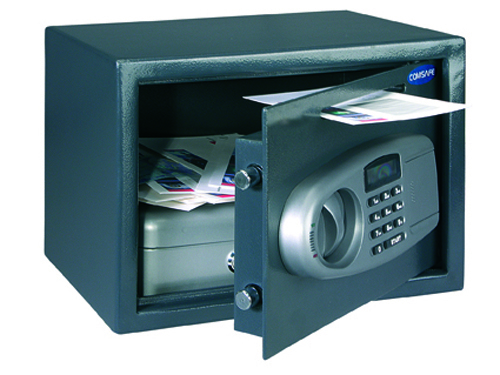 The safe is secured by a modern electronic lock with 100 million code possibilities (up to 8 digits). The lock is simple to use thanks to the large and easy to read display. It has a User code and electronic emergency opening (Master code) making it well-suited for use in a hotel. Emergency key unlocking is also available in the event a code is forgotten or the batteries run out.